The 1954 decision Brown v. Board of Education (I) famously overturned Plessy v. Ferguson (1896) and ended decades of legally sanctioned racial segregation in public schools. In 1955, the Court returned to issue in Brown II, on the question of relief. The NAACP, the organization that had brought the suit in Brown, argued that desegregation should proceed immediately -- or at least within firm and clear deadlines. However, fearing hostility and an institutional backlash from the states -- who countered that immediate desegregation was impracticable -- the Court declined to adopt the NAACP's proposed standard and instead declared, equivocally, that desegregation must proceed with "all deliberate speed." 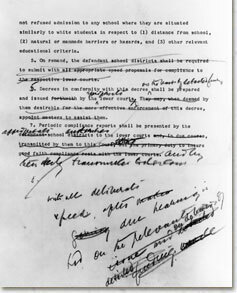 Here, a draft version of page two of the decree in Brown II from Justice Felix Frankfurter, with the Court's eventual standard -- "all deliberate speed" hand-written in the margin.